We found the villa to be perfect for our extended family's holday. 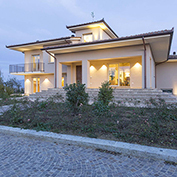 The villa was clean and well presented in a perfect location that was accessible to many of the wondeful attractions of Tuscany, or simply to relax by the pool in the warm afternoon's. The owner was excellent who was attentive to all our needs, and who took us on a tour of the vineyard which was followed by a great wine tasting. I would recommend this villa to all.